One of the problems that arises in the process of drawing lands and lakes boundaries is the problem of determining the relative nesting of land and water areas. It’s a common thing, when there are lakes inside the continent, and, in turn, there can be islands in those lakes. In principle, infinite nesting is possible: there can be pools of water on the islands, in which there may be small islets, and so on. When the boundaries between land and water are determined the role of these boundaries are not always clear. A boundary line may be the mainland coastline or the shore of a lake. The task here is to strictly define the boundary of which object is the given boundary line. You can accomplish this task using PostGIS extension, just as we used it to create rivers with variable widths. As an example, we consider four simple geographical objects as in the picture: red squares are the continents, blue square is the lake, and yellow square is the island in this lake. It is natural to consider that the lakes’ areas belong to the mainland, and the lake islands’ areas belong to the lakes. That is, all our objects are polygons without holes. 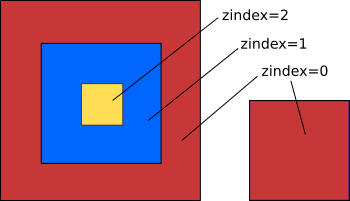 In this case, the objects will be located either side by side (if they do not intersect) or one above the other, as if in layers. Partial overlapping of objects are not allowed (in the project this is provided by geography objects creating procedures). Let’s create a GIS database of those objects. fid is feature id of the polygon. pfid is the id of the polygon container in which the given polygon is directly contained. zindex is the layer number in which a polygon is located. area is the area of the polygon. In this example, we calculate the 2D Cartesian area of the polygon; if you need an exact area on the sphere, then you need to go to PostGIS Geography Type. geom is the field with geographic data in the Mercator projection (EPSG:3785). For efficiency we should create some indices. area_idx and pfid_idx are the standard indices on area and pfid fields. polygons_geom_idx is the GIST index on geom field, which speeds up the process of finding the nested polygons. You may prefer to create indices after filling out the table. The procedure arrangePolygons() scans the polygons table and finds the container polygon id. If there is no container for a polygon then NULL value remains. The procedure is quite simple and consists of two nested loops. In curs_parents cursor we use ordering on area to find the object’s container: from those polygons that contain the given one the container will, of course, have the smallest area. Note that we use a variant of the _ST_Contains function with an underscore, since ST_Contains could preliminary access the polygons_geom_idx index, which we have already used with && operator on the bounding boxes. The expression `SET enable_seqscan TO off;‘ is here for forcing usage of defined indices. The second procedure setZIndex(Bigint, Smallint) sets zindex of polygons and it is recursive. We pass the container id (NULL if there is no container) and the current zindex as arguments to it. At the very beginning, one of the two applicable cursors is selected depending on the container id value. Inside the loop, the procedure is called again for those polygons whose container is current polygon. zindex value is increased by one on every recursive call. We should get following results. 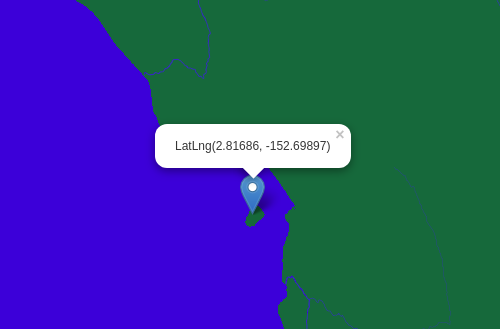 The pfid column gives us the container id, the value in the column zindex shows to us the type of the polygon object: if the value is even then it is the land coastline, otherwise it is the lake shore. Zero value corresponds to the isolated polygons: continents or oceanic islands.